GILDA'S BLUE BOOK OF THE SCREEN: A highly recommended site! Gilda's got the goods on Valentino, Veidt, Novello, and many more! MY GOOD FRIEND BROOKSIEBUFF HAS A BRAND NEW SITE ON LOUISE BROOKS! THE SILENTS MAJORITY: The biggest, most informative silent movie site on the web! CLARK GABLE'S SHRINE IN CYBERSPACE: Clara's youngest fan has a site devoted to her "Plastic Age" co-star! DELORES COSTELLO WEB PAGE: Delores gets good treatment here! MARY PICKFORD: finally gets her own home in cyberspace! JOAN CRAWFORD WEB PAGE: A very attractive site on Clara's old pal! 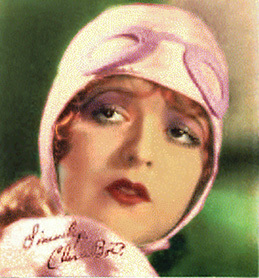 NANCY CARROLL: now has a home in cyber-space! Here is a very useful list of LINKS.